Real stock rebound or a fool's rally? (CNN) -- If you've been afraid to check your portfolio or open your 401(k) statements in the past few months, now might be time to peek. 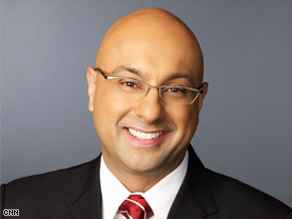 Ali Velshi is CNN's chief business correspondent and host of Your $$$$$, CNN's business roundtable program. All of the major stock averages have rebounded since hitting frightening lows earlier this year and experts are predicting an end to the recession soon. But is the worst over? CNN.com talked with CNN chief business correspondent Ali Velshi about what to expect. CNN: The stock market has been on the rise lately. Should people be encouraged? Ali Velshi: They should be encouraged that there's movement in a good direction. It's been eight weeks of generally positive movement. The thing to not fall victim to is the trap of thinking that this rise may continue at this pace. We are well off the bottoms that we reached on March 9, but this is typical of coming out of a bear market: A fast acceleration that can then be stopped by another fast deceleration. It doesn't mean we're out of the woods yet. CNN: A lot of people are calling it a fool's rally. What do you think? Velshi: One never knows until it's over. This market was thought to be quite heavily oversold, much lower than it should be given the circumstances. That's the interesting part about the market at this point: is it a fool's rally or is this real? You'll only know in the rear view mirror. The fact is we have had a stronger gain off the bottom of this market than one typically gets at all. Typically, you get as much as about 15 percent -- we're already 30 percent higher than the bottom. So you don't know until the end which is why it's important for the investor to have a strategy that allows them to be diversified so they can buy and sell stocks or mutual funds as it becomes necessary. CNN: Are we seeing any signs that the economy is recovering? So a collection of voices of people who look more specifically and scientifically at economic data say that it's ending. But the most important [sign] is that the stock market, which is a leading indicator, is going up. The deceleration in the housing market appears to be slowing. The third one that we haven't seen movement on is jobs. CNN: There's a saying among some investors,"Sell in May and walk away." Are we in a traditionally tough period for the stock market? Velshi: No, I would ignore sayings and rules like that. We're so out of the norm at this point that none of that applies. CNN: Tomorrow, the government will release the bank stress test results. What will we find out? Velshi: We're going to find out that anywhere between two and 10 of the 19 banks are going to be told by the government that they've got to raise a lot of money. Obviously, it looks like Bank of America and Citigroup will be in the worst shape. But some reports indicate that 10 banks out of the 19 may be told that they are less healthy than otherwise thought. So depending on how severe the prescription is, it could affect markets and could be fairly negative. Remember, these banks are already really beaten down. CNN: When do you think the job market will recover? Velshi: I think we're headed for worse before we're headed for better. It could be toward the end of the year before we start seeing the job losses level out. Remember, we're losing 500,000-plus jobs a month. In a healthy economy, you should be gaining 100,000 jobs per month just to keep the unemployment rate even. So that's a problem, we're not anywhere close to that. We were at 4.9 percent unemployment rate when this recession started. The government's predictions are that we won't get back to that stage possibly until the end of 2012. CNN: Ben Bernanke said yesterday that the U.S. economy will begin to rebound later this year, but the recovery will be slow. What did you think of his comments? Velshi: I think they make sense. I've been a believer that this thing ends in 2009 and that there are probably lots of road blocks. But remember, the recession ending doesn't mean a net improvement for people. It'll still be a long time before home prices improve and we start adding jobs in this country, so for most people what they feel may not improve for some time. CNN: When do you think the housing market will turn around? There are two things that tell you the housing market is getting better: One is people are buying more homes and two, the prices are going up. We're already seeing people buying more homes because interest rates are as low as they are and home prices are as cheap as they are. But we're not seeing the prices go up because so many of the houses that are being bought are in foreclosure or they're distressed homes. Some pessimistic views are that this won't happen until 2011. I take the view that it will probably be earlier. I think you'll start to see a leveling in home prices over the course of the next few months and maybe even some improvement next year.